The ability to fly has long sparked human curiosity, and envy! 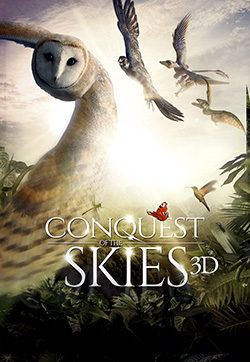 In Conquest of the Skies 3D, travel through time and around the world to unravel the 300-million-year story of how animal aviators have evolved into the 100 billion creatures flying through the air today. Explore nature’s ingenuity as you soar from a falcon’s point of view, see hummingbirds flutter in slow motion, accompany bats in the hunt, meet lizards that glide with the greatest of ease, and find out how clumsy beetles got their wings. Filmed on location in the United Kingdom, Borneo, Spain, Italy, and Ecuador. 40 minutes.